The Pitch: The CERN facility goes haywire and causes a new pocket universe to form over the whole of Europe. Everything within the region begins transforming into an altered state that can best survive according to the laws of this reality. Now this pocket reality, once thought stable, shows signs of exponential growth that will envelop the rest of the Earth. In an act of desperation, the United Nations sends in one final team of iron-willed, egotistical, narcissistic, operational specialists into the rift. The hope is that at least one of them will have the strength of character to save the rest of humanity before it’s too late. 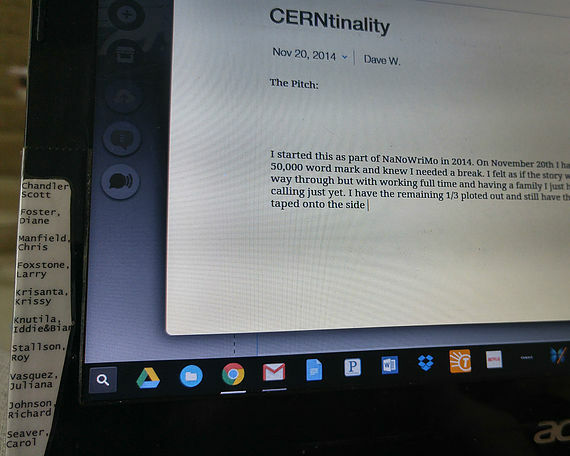 I started this as part of NaNoWriMo in 2014. On November 20th, I had reached the 50,000-word mark and knew I needed a break. I felt as if the story was about 2/3 of the way through but with working full-time and having a family I just haven’t headed the calling just yet. 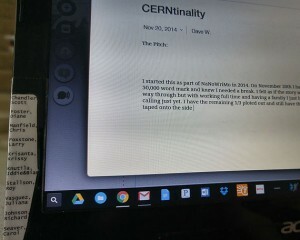 I have the remaining 1/3 plotted out on pages and still have the characters names taped onto the side of my Chromebook. You can see this in the picture below.